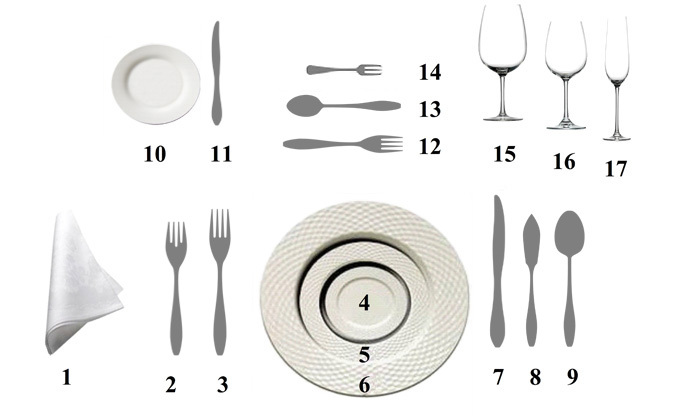 HOW TO SET THE TABLE Frequently Asked Questions | Cathylin - forks, spoons, knives, plates and glasses. As shown in the figure, the forks are positioned to the left of the plate - first the Table Fork and then the Fish Fork. To the right of the plate are the knives - first the Table Knife then the Fish Knife, each with its sharp edge facing towards the plate. The Table Spoon for soup goes next to the knives. The Fruit Fork and Fruit Spoon are positioned horizontally above the plate, with the handle of the fork towards the left and of the spoon towards the right. A Fruit Knife may be inserted between these two, facing in the same direction as the spoon. The fruit cutlery may be joined by a Dessert Fork to complement the desserts. The glasses are positioned slightly to the right of the plate, at about the same height as the knife. There should be at least two glasses - a larger one for water and, to its right, a smaller one for wine. If more than one wine is to be served during the meal, the number of glasses increases, always being positioned to the right of the water glass. To complement the arrangement, place markers may be added in front of each setting. Table size is very important for the diners' comfort and to support the right atmosphere during the meal. The table needs to be spacious enough to put the guests at ease. Beware, however, because too much space can hinder conversation during the meal and dampen the atmosphere. One of our first decisions while setting a table involves selecting the tablecloth. There are different kinds of tablecloths - linen or cotton, monochrome or decorated, softer colors or colors that strike a contrast. The most important thing is to figure out the tablecloth that goes best with the type of event you are hosting. After the table has been properly set with the cutlery, plates and glasses, you can add an extra touch with table decorations. A floral or fruit-based centerpiece can be used; candles can be added for atmosphere or to create original artistic compositions. Our advice, though, is to limit the overall size so as not to interrupt the flow and the lines of sight between the diners. Choose your own style to add a touch of originality to your table. Cutlery is one element that can be played with to express your personality by choosing from an infinite number of different design solutions. 3V Venosta helps you narrow in on your style by providing a wide variety of different models, each one unique, to be united with your style.